For the crepes, whisk all of the eggs together until frothy. Add remaining ingredients and whisk until smooth. Heat a non-stick pan on the stove top (I used a 10 inch frying pan), and add about 1/2 to 3/4 cup (almost a full ladle) of batter to the pan. (I lightly oiled the pan first). Add it to the middle of the pan and then lift and twirl your pan a bit to evenly spread the batter. After about 1 minute, gently flip the crepe and cook the other side. If it's taking longer than 1 minute to be ready to flip your crepe, your pan is either not hot enough or you've added too much batter to the pan. It takes a couple crepes to get in a groove. To prepare the filling, I put all of the ingredients in my food processor and gave it a quick blend for about 10 seconds. 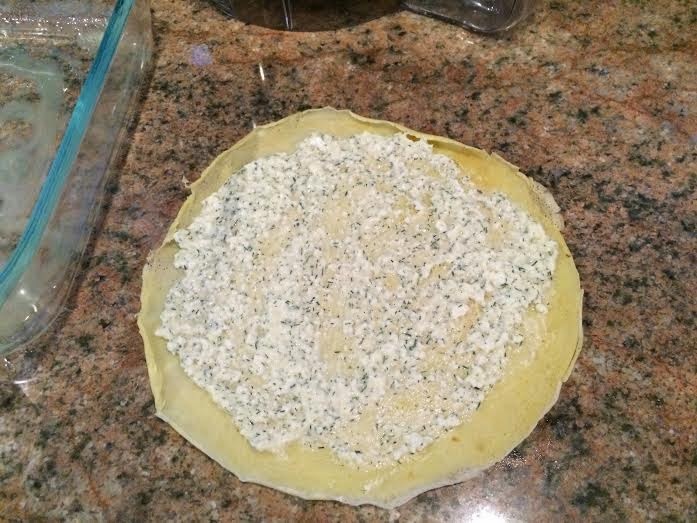 Next, generously coat each crepe with the cheese mixture, and then roll up tightly. I got a total of 10 crepes with the above recipe (excluding 2 flops that I had to throw out). 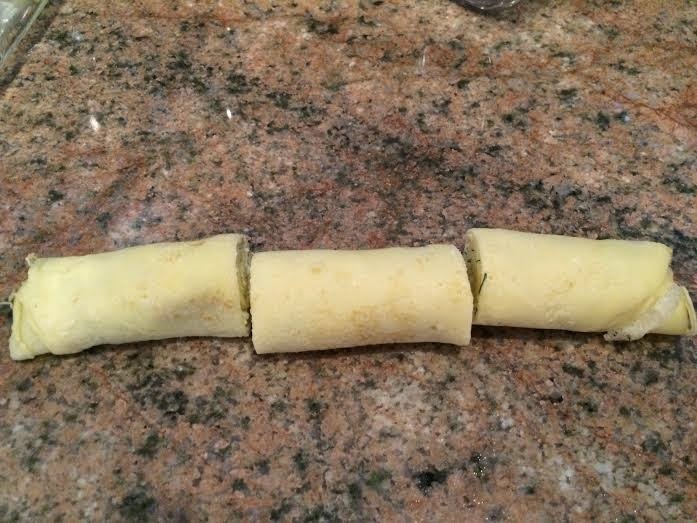 Cut each rolled crepe into 3 sections so that they can be layered in a pan nicely. I put my crepes in two 9x9 pans, and froze half for another day. I remember my grandma making big batches and doing the same. 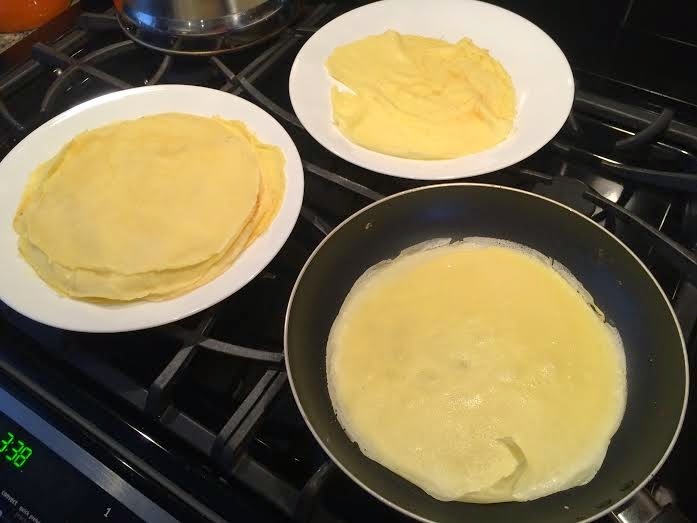 To make sure they don't all get stuck into one delightful clump (as they puff up during baking), it is very important to generously brush the bottom of the pan and top of the crepes with melted butter. Plus it makes them even more delicious! I melted about 1/4 cup of butter as suggested by Claudia, although I know this is significantly less than my grandma used. However, I found this was PLENTY! 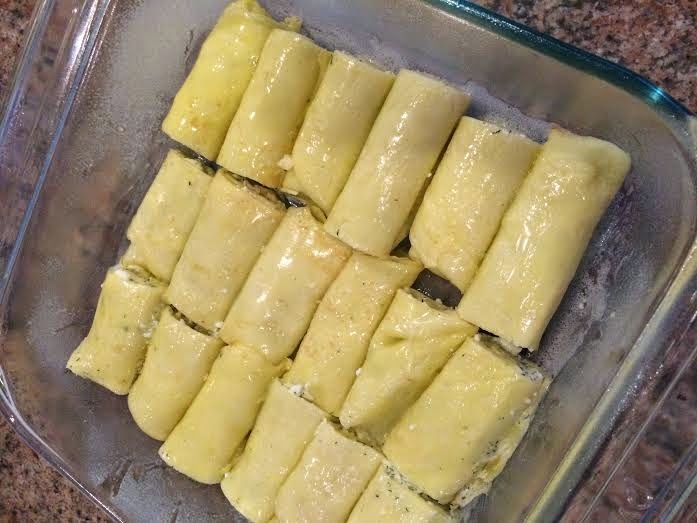 Cover the pan tightly with foil and bake for about 30 minutes in a preheated 350 degree oven. Unfortunately I don't have a photo of the finished product because I forgot..... but they looked almost as awesome as Claudia's picture, and tasted delicious! Very close to my grandma's....and a perfect comfort food for a chilly holiday evening.